I grew-up in a home with everything was homemade- including the pumpkin puree used to make Thanksgiving pumpkin pie. We grew our own pumpkins in the garden. My dad always planted heirloom seed and planted a French variety pumpkin that made the BEST pumpkin pie. We would grow our pumpkins, puree them and measure out a specific measurement of puree then place in freezer bags and freeze the puree until we were ready to use it. That way all we would have to do is go the freezer, thaw the pre-measured pumpkin and add it to our recipe…and let the magic begin. Personally, I do not like ANY canned pumpkin. Maybe it’s the feeling of accomplishment eating my own processed pumpkin, I don’t’ know. But, I do know there is a major taste difference in canned vs. processed pumpkin. 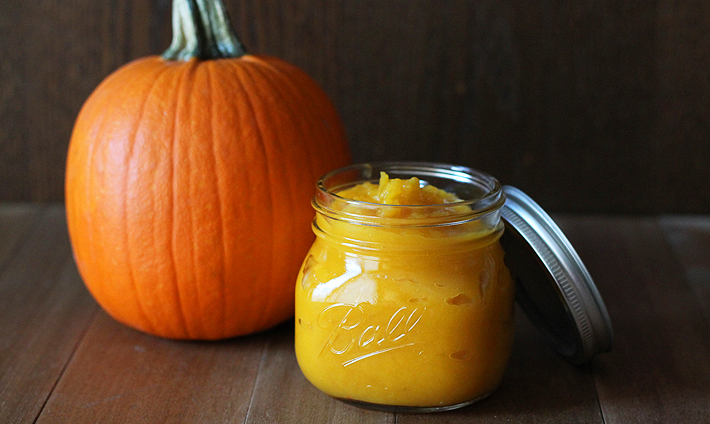 If you are worried about a long process to make your own pumpkin puree, don’t fret. It’s a fairly simple process to actually process your own pumpkin puree. First, pick out a small sugar pumpkin or French variety. Not the large Jack –o’-lanterns you see in many farmer’s fields. Those types of pumpkins have a very fibrous flesh and are not as sweet tasting as the smaller varieties. The smaller variety only weighs about 4-8 lbs, has a good stem intact and needs to have no soft spots of blemishes. Here’s a list of good varieties for making your own pumpkin puree. You can find these smaller cooking pumpkins at farmers markets, specialty stores and sometimes even grocery stores. *I like to pre-measure all my puree in freezer bags. This way it’s very easy to go to the deep freeze and grab a pre-measured bag. I also like to add some spices like cinnamon, nutmeg, and ginger to some of my puree and freeze in ice cube trays to use for smoothies. Your are guaranteed to impress family and friends with your next pumpkin creation using homemade pumpkin puree!